Linksys has stepped into the HomePlug market with its PLK200PowerLine AV Ethernet Kit. Powerline technology is certainly going strong, but Linksys has been tardy in bringing a kit to a European audience. HomePlug (or PowerLine) networks PCs and other devices using the power cabling in your home. The adapters simply connect to an Ethernet port and plug into the wall. The kits are extremely easy to set up - often simply plugging them in is job done. 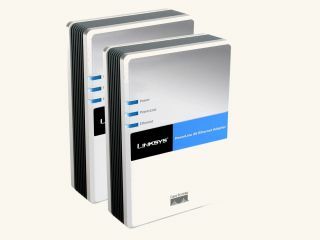 The Linksys pack includes two PowerLine AV Ethernet Adapter (PLE200) units which can also be bought separately. These units conform to HomePlug AV, a standard for HomePlug tech from the HomePlug PowerLine Alliance. That means they can be used with other adapters that also conform to this standard. This standard implies throughput speeds of 200Mbit/s, though Linksys claims a more realistic 100Mbit/s. We're guesstimating around 80-90Mbit/s of speed, though as ever with HomePlug kit, this depends on the vitality of your wires. What you really need to know is that such a bandwidth will enable you to safely stream HD at the same time as surfing the web or playing an online game. "HomePlug AV is an ideal solution to connect media adapters, set top boxes and other networked entertainment devices to a home network because of the high bandwidth," said Matt McRae, Linksys director. Coincidentally, he's also a key member of the HomePlug PowerLine Alliance. "PowerLine AV solutions introduce complementary networking technologies in the home that can work seamlessly with other standards-based technologies like Wireless-N and Ethernet."